According to the Synoptic Gospels, Christ cried out aloud twice on the cross (see Matthew 27: 46, 50; Mark 15: 34, 37). However, Saint Luke alone tells us what Christ said when he cried out when he cried that second time: “Father, into your hands I commend my spirit” (see Luke 23: 46), which is our seventh and last reflection this afternoon. This saying, which is an announcement and not a request, is traditionally called “The Word of Reunion,” for Christ has accepted the will of God the Father in Heaven. This is the seventh last word. 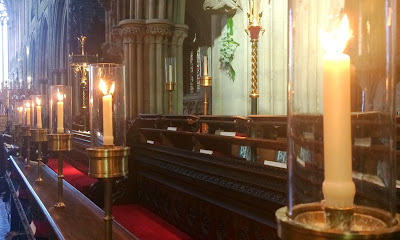 It is followed by silence – the silence of the grave, the silence of Christ lying in the tomb, the silence of the disciples who have lost their sense of direction, their focus, their understanding, their control – and our silence before the resurrection. So often I want to be in control. I want to control the agenda, I want to control conversations, I want to control discussions. And I particularly want to control the words I use, the words others are going to hear me say. And so I am humbled at times when I listen to Leonard Cohen’s song, If it be your will. Leonard Cohen sings of his nearly complete subjection to the divine will. If he is told to be silent, he will be silent; if he is told to sing, he will sing. If he is allowed to express his true voice (“if a voice be true”), he will sing in praise of God from the “the broken hill” ... from Calvary? The mercy of God, the compassion of God, the love of God, redeems the burning hearts in hell ... if it is God’s will. Leonard Cohen’s great hope in this will leads to prayer, to the one who can “make us well” if we devote ourselves to God, pray to God, sing to God. But he still prays to God to act on behalf of the suffering. Cajoling God in song and poetry, Cohen says God has the power to “end this night” of the darkness of the human condition, in which people are dressed in only dirty “rags of light” that are fragmented, that are not fully whole and illuminated. The broken hill is Golgotha where he has been crucified, the rugged and rocky Mount of Calvary. “Let the rivers fill” may refer to the water of his thirst, the water of his sweat, the water that streams from his side, the waters of baptism, the Living Water that will never leave us to thirst. In our journey today, we have been concerned, not just with the last words of Christ on the cross, but also with the meaning of his life for our lives, the meaning of every life for our lives. As Timothy Radcliffe says: “We must wait for the resurrection to break the silence of the tomb.” We must speak up when it is necessary, and to have the courage to speak is “ultimately founded upon the courage to listen.” But at the grave, at times of desolation, at times when there is no answer, we may also be called to be silent. you commended your spirit to the Father. for your mercy’s sake. Amen. (Revd Canon Professor) Patrick Comerford is Lecturer in Anglicanism, Liturgy and Church History, the Church of Ireland Theological Institute, Dublin. This is the seventh of seven reflections on “the Seven Last Words” on Good Friday, 3 April 2015, in All Saints’ Church, Grangegorman, Dublin, where the Vicar is Archdeacon David Pierpoint.